Spring is the most puzzling season to dress appropriately for. The weather is partly to blame. On warm afternoons, there is an incredible temptation to shed our winter layers of wool and cashmere in favor of sleeveless blouses and bare legs, but the post-winter chill still reemerges at random hours. And unexpected bouts of rain pose a threat to delicate fabrics and new ballet flats. Spring fashion also fails to get its due respect when people go running for their shorts and flip-flops as soon as the temperature hits 50 degrees. Not only is this over-eagerness to wear summer clothes a bit desperate, but it’s also highly impractical, and you’ll regret those shorts as soon as the sun starts to go down. I personally reject the notion that spring is just a cooler version of summer. We should instead take time to relish the gentle warmth and brisk air before the humidity and boiling heat sets in, and even enjoy the rains we’ll be clamoring for by August. Dressing for spring means different things for different people. When I think of spring, I envision a clean slate, with tailored pieces in cream, beige, and ivory. Several different designers opted to create a blank canvas with their Spring/Summer runway collections. Take Emilio Pucci and Valentino, who showcased sheer white pieces that were layered for subtle transparency without being too revealing for everyday wear. White also took the form of neat sportswear at Lacoste, and bright white pieces with mesh detailing were a similar nod to athletic apparel at Chloé and Richard Nicoll. White clothing on this year’s spring runways was evocative of movement and an active lifestyle, perfectly embodying the rejuvenation and vitality of spring. Others will look to the glorious spring surroundings as inspiration for their wardrobe. Every year retailers aim to convince us that spring means festooning ourselves in floral prints and pastel colors. 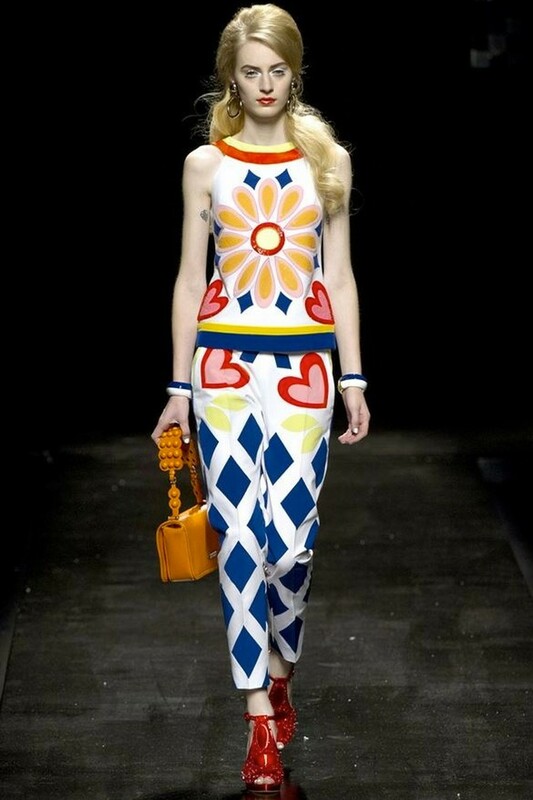 However, the Spring/Summer Moschino collection rejected simplistic representation of flowers in favor of bright, geometric floral prints that practically screamed for attention (a reference to later 1960s fashions, no doubt). Chanel and Dolce & Gabbana did away with prints and instead featured three dimensional fabric flowers sewn onto dresses and coats for a whimsical effect. Meanwhile, Prada stencilled oversized Warhol-esque flowers onto glossy black coats, and Ralph Lauren scattered red carnations onto moody Spanish-inspired eveningwear. Flowers are inevitably incorporated into spring clothing, but that doesn’t mean they can’t be interesting and unconventional. How do you translate all of this into your everyday wardrobe? Chances are you’ll still need layers, but thankfully you can put away your heavy winter sweaters and instead reach for breathable cotton cardigans. You may need a coat to protect your delicate whites from the elements. And while the trench coat is my ideal spring outerwear piece, there are a variety of other mackintoshes or even long, fitted blazers that will do the job nicely. I might add a pale blue linen scarf, because it’s hard to resist pastels altogether, but do exercise restraint with Easter egg hues. Most of all, don’t be afraid to wear rain boots with your updated floral print dress, because it shows a carefree balance between beauty and practicality. And that’s what spring is all about.